The original print and web versions of this report contained errors in the Health Care—Medicare section of Highlights and Trends. 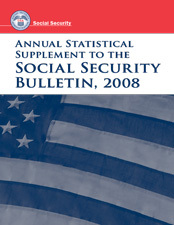 For "Number of enrollees in July 2007 (one or both of Parts A and B)," the values given for all, aged, and disabled enrollees were incorrect. The correct values of 44.3 million, 37.0 million, and 7.3 million, respectively, now appear in the web versions of this report. The original print and web versions of this report contained errors in Table 5.F9. The number, cumulative percentage, and average monthly benefit values in the 1969 row were incorrect. The correct values are 2,190, 99.9, and 742.60, respectively. These errors have been corrected in the Web versions of this report. In Table 8.B2, the number of "persons served (thousands), Hospital Insurance" for 2006 was incorrect. The correct value is 1,277. The original web version of this report contained errors in Table 6.D7. The numbers of nondisabled widows and widowers aged 60, disabled widow(er)s aged 50–54, and widowed mothers and fathers aged 65 were incorrect; these errors were detected prior to print publication and have been corrected in the web version of this report.